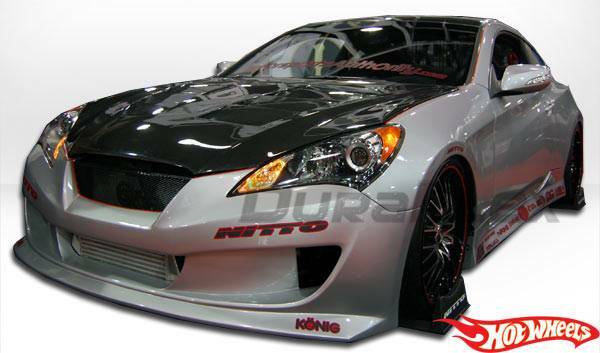 This Complete Kit Includes Hot Wheels Front Bumper, Hot Wheels Rear Bumper, and Hot Wheels Side Skirts.Extreme Dimensions' new Duraflex premium aerodynamics combine fiberglass, plastic, and flex resins to obtain its unique features. The new Duraflex technology obtains a much higher durability rate than the average fiberglass product, resulting in reduced shipping damages up to 75%. Duraflex products feature a black primer finish, high quality mesh grille, hardware kit, and an installation guide to help you install the product. This revolutionary product allows you to receive a premium fiberglass product at an affordable price. Cars depicted are highly modified for show which may include molding or adding to the original piece. Parts such as lights, splitters, canards, paint, and others accessories are not included unless specified in the product description.